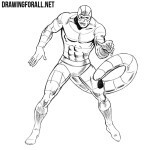 New drawing lesson already waiting for you, in which we will draw a very popular comic book character! 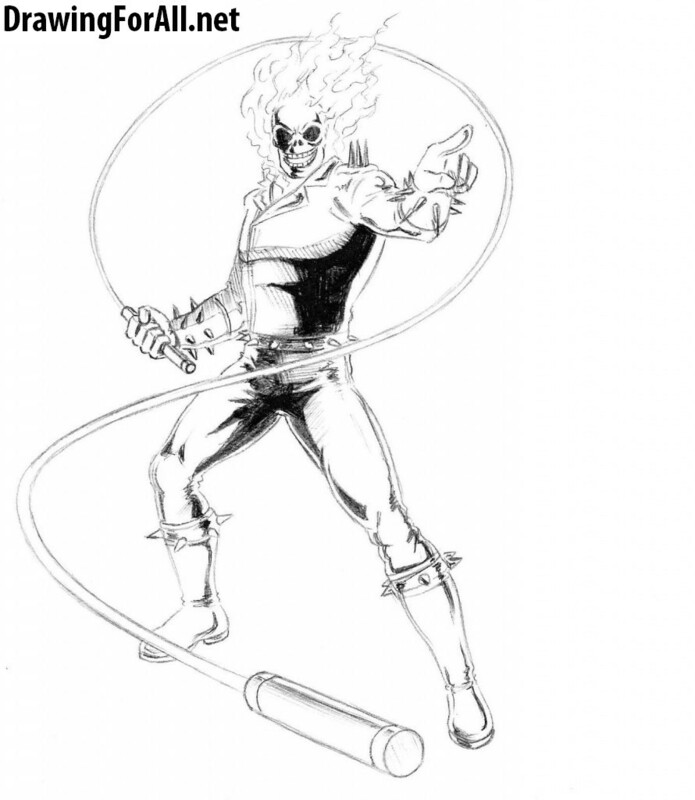 As you guessed, today we will learn how to draw Ghost Rider from Marvel Universe. 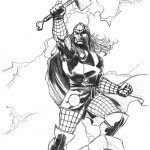 This character looks like a embodiment of hard rock, but in fact, it is not so difficult to draw him. 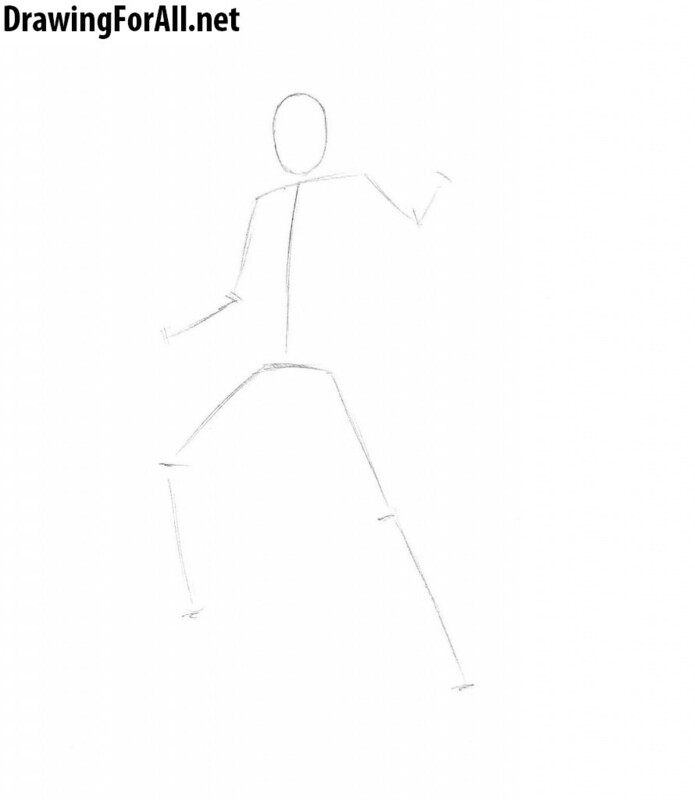 Let’s start with stickman. As you know, we start drawing humans with the head (that looks like an oval), then using simple lines draw the neck, spine and limbs. Our Ghost Rider stands in dynamic posture, legs apart widely enough, right leg bent at the knee. As you can see, our Ghost Rider standing with his famous whip in one hand and points at us with the finger of his second hand. 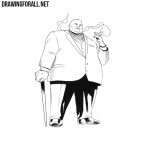 At the second step, as in all other drawing tutorials, we add volume to the figure of the character. So, first mark up the head using a pair of intersecting lines – vertical (facial symmetry) and horizontal (the location of the eyes). The head should be mounted on the short, reliable cylindrical neck. 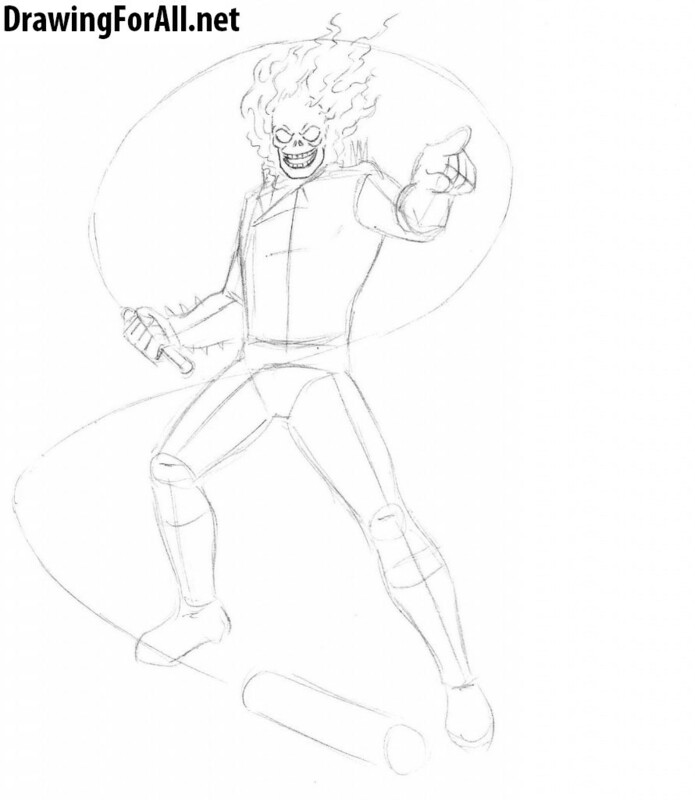 Next, outline the torso of Ghost Rider. Now let’s work with the arms. The upper arm and forearm are represented by cylinders (applies to both of arms), with the forearms taper toward the hands. Excellent. We move on. Immediately after the body (as always, we draw from the head to the feet, that is, from top to bottom) we draw the pelvis area, which is denoted by a triangular figure. Don’t forget to be guided by the lines of the stickman, to avoid confusion. Below the pelvis we draw the legs in the shapes of cylinders. 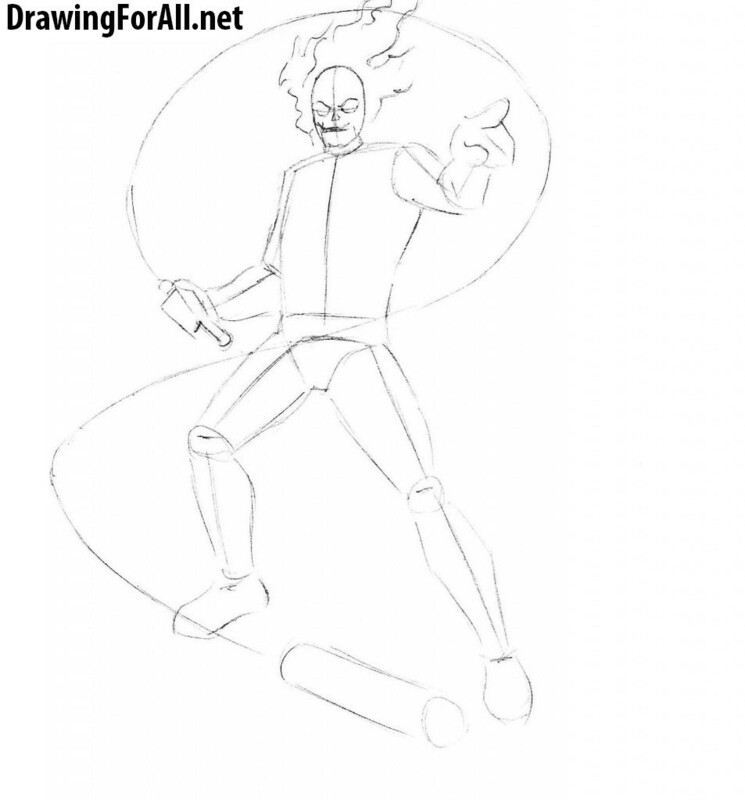 Fundamental steps in the tutorial on how to draw Ghost Rider are ready. Now is the time to begin to draw the details. Therefore, starting with the head, or rather, with the skull. Using the markings from the second step, draw the eye sockets. Then draw the nasal cavity. Under the nasal cavity draw the contours of the upper jaw – it should be slightly bent. Draw outlines of the chin, as in our sample. Also, we outline the contours of the flame in this step. There is an interesting point – they surround the head, and tongues of fire should be draw in the direction from the head to the tips, that is, as we draw the hair. Then outline the whip, that Ghost Rider holds in his right hand. Please note that the whip resembles an inverted letter S.
Now we work only with the skull and flames. Erase the guidelines, that we drew in the second step. Above and below the eye sockets draw smooth lines, as in our sample. On the upper and lower jaw draw quite ordinary teeth. Also in the last step we have outlined the contours of a fiery halo around the skull of Ghost Rider, now we need to draw the internal flames. Therefore, draw wavy lines with its characteristic fire “sharp” ends. Draw them as in the previous step, i.e. in the direction from the skull base to the tips. The hardest part of this step – certainly the fingers. Fingers are the most mobile part of the human body, but they do not have muscles. The fingers are driven by muscles of forearms. Look to the left hand of Ghost Rider – the index finger is particularly well shows that the whole hand is shown in perspective. But in addition to the hands in this step, we need to draw the contours of spikes, which are located in the shoulder area , as well as similar spikes on the forearm. Here we draw the collar of his leather jacket. We continue adding details to the arms and torso. Erase the extra touches from the torso.By clear, confident lines draw the collar of his jacket and buckle, which departs from it to his belt. 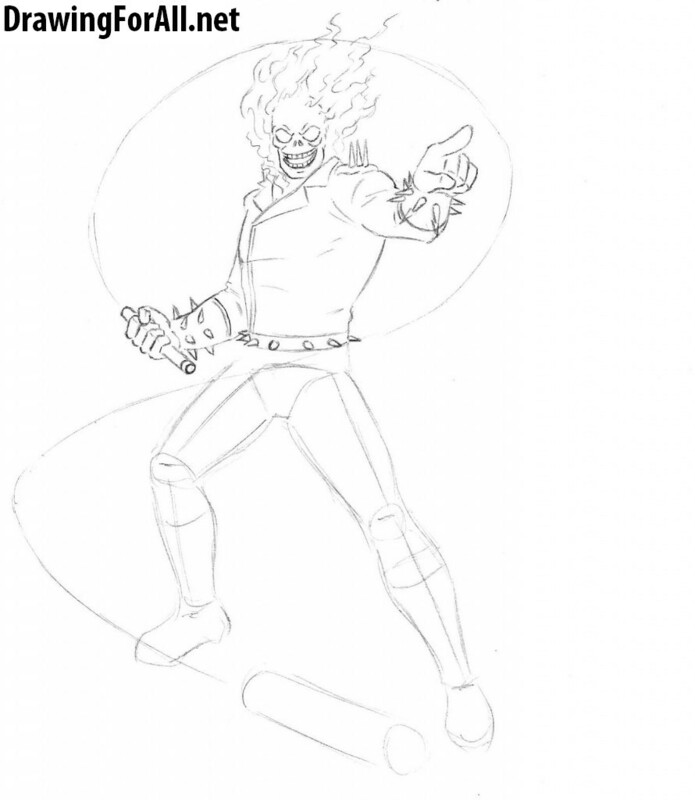 Don’t forget to add some folds to the jacket of Ghost Rider. In the lower part of the torso draw belt with spikes. We finished the torso, and now proceed to the arms. Erase the extra guidelines, and carefully circle the parts, namely the phalanges, the outlines of hands, spikes in the area of ​​the forearm and the folds of the jacket. Now draw the main weapon of our superhero, namely – the whip. First, Let’s give a finished look the handle. So circle the handles by clear lines, then using two long curved lines draw the whip. In our picture the weapon of Ghost Rider not very similar to the chain, ie here we will not draw the links, but simply denote it as a rope. Given the prospect a whip in one part must look more narrow than in another. 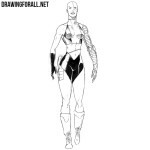 Ok, now you can begin to draw the bottom of the torso and legs. Here we erase the guidelines and circle the contours of the legs of Ghost Rider. Please note that the legs taper in the area of ​​the knees and ankles and expanding the middle of ​​the thigh and calf muscles. …Adding shadows. First, we define the light source – in fact, in the case of our Ghost Rider, it’s easiest to do, because on his head (and above it) constantly raging inferno. It should be noted, that in front of us today we have a representative of the typical style of comics in terms of imposing shadows. 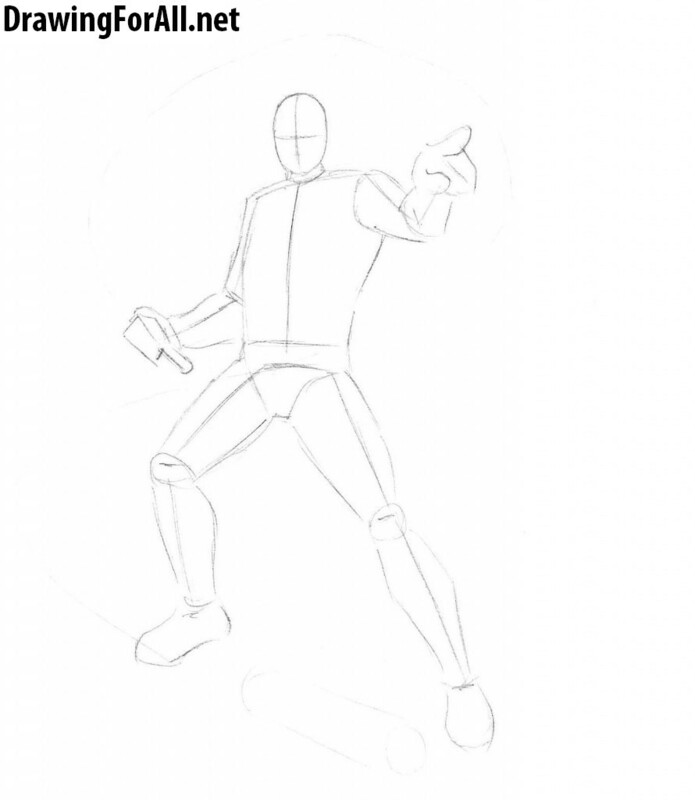 Similar shadows you can see in drawing tutorials about Spider-Man, Punisher, Iron Man and Loki. As you can see, the shadows are dark and very contrast. Recall, that similar shadows we draw in two stages – first we draw the outlines of the shadow, then paint the area inside the contours. In order to add a semitone you need to use a simple hatching. 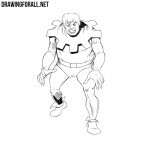 Indeed, a difficult drawing lesson, one of the most voluminous about comics characters on our website. If you like the infernal theme, we can advise you a lesson on how to draw a dragon – it is also very difficult. And as we always say in the end of all our drawing tutorials – don’t forget to subscribe to us in social networks, such as Google Plus, FaceBook, Pinterest and other.